5 Keys To Success For Every Small Business Website - iSmallBusiness.com - Small Business Stuff That Matters...Pass It On! No matter what industry you’re in, your small business needs a website. Whether you’re just starting out or you’ve been in the website game for a long time, there are things you need to consider for your online presence. It’s not enough to have a static, outdated page in today’s online world. Your business needs to have several factors to keep it on the leading edge and to establish yourself as a professional go-to in your market. People are looking at your website and for many, this will be their first point of contact with your business and product. If your website isn’t up to speed with today’s standards you’re definitely losing potentially new clients you don’t even know about. The first thing most people do today before visiting a hotel, finding a place to eat, buying a product or considering a service is check out their webpage. If there is no webpage, it’s rare people will call or stop by. If there is a webpage but it’s poorly done, it’s rare people will engage with your brand any further. Don’t make the mistake of thinking you can get around a website. 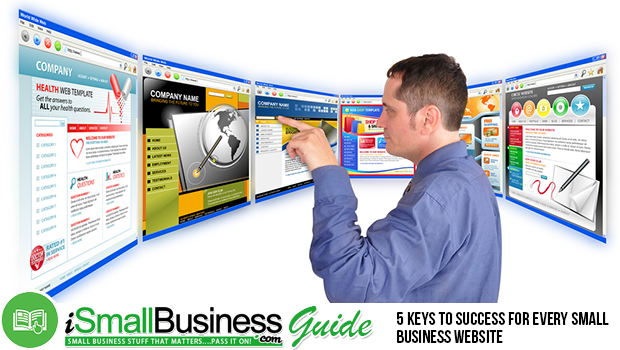 Here are five keys to success for your small business website. Make sure your website is meeting all these expectations to ensure your ongoing success. First and foremost, what your website looks like matters. Unless you are going into the business of designing website, I highly suggest, even implore you, to hire a web designer. They’re going to do so much more and so much better than you could ever do on your own. This isn’t a home repair project: it’s the world’s window into your business. Make it professionally done so that people get a sense of your company’s professionalism. It’s crucial you have a good looking, well designed website. There are a number of ways to find a great web designer. One way is to check the design info at the bottom of web pages you like. Most website will say at the very bottom in the footer (along with a hyperlink) who designed the site. You can start that way to try to locate a designer you want to try. Other great possibilities include using freelance market places where you can find designers and check out their portfolio of work and client reviews, as well as put your project up for bid to see who would be interested in working on your design. Here are some things to consider in your design. Logos: If you already have a logo, you’ll want to provide it to your web designer to not only incorporate into your site, but also build your site aesthetics around. If you don’t have a logo, ask your web designer if they’re able to build one for you and include it in the cost of your website build out. Alternatively, you can look for your own logo design separately, and then send out to your designer. A logo should be an attention grabbing, visual representation of your business. Think of the power of the Mac Logo (the apple) or the McDonalds golden arch. These logos represent the company without even needing to say their name: that’s how strong the brand has become. If you see your small business being a legacy, consider a powerful logo that truly embodies your business. Color Scheme: What colors do you want to use and how will you use them? Tying them into your logo is one thing but if you’re starting completely from scratch, you may want to consider checking out the importance and psychology of color. The next part of important website design is the content that you put on it. Writing is a skill that many people think they have or at least think they can pull off but when it comes to your website you really want to hire an expert to do the writing. Sure, you may want to craft your company blog posts yourself (because you should have a blog or news section of your website) but all the rest of the actual writing on the pages of your site needs to be written by a professional. A copywriter will be able to convey what you do in the proper voice of your company culture and your target market’s vocab. You need the right message to hook the right people. You need to write compelling headlines and strong calls to action. Don’t try to stumble your way though the writing process… hire a copywriter. The same freelance sites that offer web designer will offer great copywriter options, too. Invest the money and do it right. Writing is just one piece of this content pie, however. The content that you continually put on your site is what becomes really important for your SEO and your clients (note: if you don’t know what SEO is yet, be sure to read on to the next key that talks all about SEO and SEM strategy). It’s not good enough to just slap some content out there on your blog and news section and hope for the best. You need to put real time and energy into developing content that provides great value to your clients… for free. That may seem counterintuitive but offering up valuable content that can help improve their lives in whatever your market is will establish you as the go-to destination for what they need, which builds trust, which in turn influences purchasing decision. If your free content is this great, then people are going to want to know how awesome your paid content and services are. Trust me, it works. Provide an ocean of value on your website through amazing content and your website will be bound for success. Here are a few other things to consider, content wise on your website for maximum success. Video: Consider having a YouTube channel and embed great video content into your blog and site. Video allows potential clients to connect with you and hear how you talk, see who you are and engage with you in a more personal way that writing alone just can’t provide. Try using video content, no matter your niche for success. Make sure it’s quality. Again, this might be something you look into getting professional help with or at least do your research to get proper lighting and equipment to do on your own. Infographics: People love information and they love cool graphic. The result is that by creating awesome infographics, you provide value and a very viral piece of outreach content. Try to get your designer to visually recreate the data and research you lay out, or consider trying sites like Visua.ly -- which works with you to create your video or infographics projects. Motiongraphics or animate videos: These are a fun alternative to those who want video but are more camera shy or feel their niche prohibits them from doing video (although that’s not true!). Check out cool companies like ToonMojo.com who work with your provided research to create cool videos about any project, company or mission. You need a social media platform that is integrated into your website strategy. Whether you feel like it’s necessary in your niche or not, believe me, it is. At the bare minimum you should have an active Twitter and Facebook account that is integrated into your website in some way. This helps the viral, share-abliity of your web content expand and it’s a great way to grow and speak to your audience in an organic way. Also, you need to have share widgets built into your web pages and blog posts. This is a must! All of your content needs to be as easy as the click of a “Share” button to spread the word across your reader’s social media channels. Even if you hire a copywriter and you hire a web designer, you still need to know the basics about SEO and SEM because they’re crucial to your website success. SEO is an acronym for Search Engine Optimization. SEM is an acronym for Search Engine Marketing. SEO you get organically and SEM you get by paying for it. One of them (SEO) is a content and writing strategy for your website while the other (SEM) is a part of your marketing and advertising strategy and budget. SEO is free while SEM is a budget item. SEO is related to how your website organically ranks in any of the big (Google, Yahoo, Bing) search engine results. When you Google “hardware store in Boulder” the results you get are being aggregated by search bots that match content in a website to what they have analyzed as being the closest match to your search terms. Can you see now why your content is so important? The stronger tied to the search terms your content is, the closer to the top of those search results you’re going to appear. And you know from searching for things online, you click the top website or two first and rarely scroll through to the other pages of search results. This is why your content being so expertly crafted is important… because there’s more to this than just putting a bunch of search terms into your content. Why? Those search bots are smart and they can sense SPAM a mile away. If they sense you’re arbitrarily putting tons of search terms into crappy content, they don’t rank you high or will even exclude you from searches altogether. Make your first sentence include your title. This is another way to strengthen the organic connection between your post title and your post body for search results. If your small business is selling composters and you’re blog post title is “ten reasons to try composting at home,” make sure the first sentence of your story includes that title. For example the introduction sentence could say, “Composting may sound overwhelming but I can give you ten reasons to try composting at home.” That sentence sets up your topic and expands on your title. It’ll help your search results. Link out to other websites and ask them to link up to you. Search results like a strong web of incoming and outgoing connections. The more links to your website through other websites, the better your search results. Links between legitimate sites act almost like job references. The more references you have and the better they are, the stronger the likelihood the search bots are going to trust you as they mine the internet for search results. How do you build those links? Do product reviews and site reviews for other leaders in your niche and include links to the original content. Now that you understand the basics of SEO marketing, here are a few things to consider with SEM marketing. First and foremost, think of it as part of a budget allocation in your marketing plan. Second, it includes things like Google Adwords where you pay to increase your visibility through things like the “Sponsored” search results you see at the top of any Google Search. Finally, like graphic design and copywriting, you should look to an experienced marketing agency, staff member or marketing freelancer who understands Search Engine Marketing as part of a piece in the social media marketing strategy. Ask your marketing professional what they’re doing to include this valuable asset to your advertising plan and make sure they are reporting updates and results. All SEM outlets should provide your marketing professional with click-thru insights and other important data statistics that can help you to alter your plan as needed with what ads and locations are working and what ones aren’t seeing engagement. Understand what you now know about content, search engine optimization and search engine marketing, it should come as no surprise that timeliness is an essential ingredient to your website. The more content you add and update, the higher your SEO rankings will be. This can be especially important not only for regular updates to your site content, but also to topical events happening in your niche. If something important is going on in your market industry, you’ll see spikes in online traffic of people wanting more information. You already know it’s essential to keep yourself informed of current events, but capitalize on what’s happening and trending in your industry and update your content to reflect that. Timeliness is one of the crucial reasons you need a blog or news section of your site. It would be overwhelming to constantly update all your website content, but keeping an active (two posts a week is industry standard) blog and daily activity going on your social media outlets will boost your visibility and credibility online. Set Google alerts to help you stay on top of the trends and write about or share content that matters in your market niche. They’re free and they’ll ping you whenever a subject of your own interest pops up that you can capitalize on.